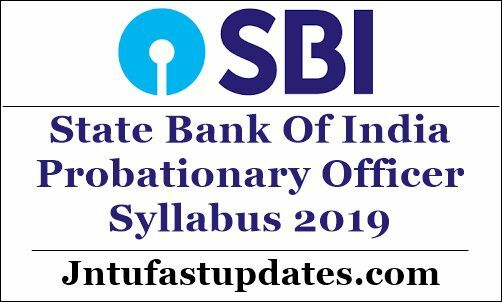 SBI PO Syllabus 2019: State Bank of India (SBI) recently released the SBI PO notification for 2000 Probability Officer (PO) posts. The SBI announced that the application process will be held from 2nd April to 22nd April. Lakhs of candidates seeking to get the SBI jobs are expected to apply for the announced posts this year. Candidates with good merit will be shortlisted for the probability officer posts. To shortlist the candidates, the SBI will conduct the preliminary examination, mains examination, and interview rounds. Candidates who are going to appear for the SBI PO selection process can get ready for the prelims exam. In order to give the complete idea regarding the SBI PO syllabus, exam pattern we are composing this article with complete details. State Bank of India releases various job notifications every year. The SBI has recently come up with the notification for 2000 Probability Officer Posts. Applicants who are in the processing of applying SBI PO posts can check the details of SBI PO Syllabus and exam pattern details clearly. As the competition is going to be high, the applicants must show their full focus on the preparation. Otherwise, it will be difficult to clear the selection rounds of SBI. Finally, the aspirants who clear all the selection rounds with good merit will be shortlisted for SBI Probability Officer posts. Hence the candidates can go through the following article and check the details of SBI PO Syllabus and exam pattern. Current Affairs of last six months especially reference to Banking Industry.